Note: This post was bumped forward one week to allow coverage of the ESA comet landing. The star chart in the thumbnail below shows November 17, not today’s date. Nonetheless, object positions are still very close to what is shown. I’ve tried many times to spot planet Neptune. Failed on every attempt. Sure, this planet is large, with a diameter 4 times that of Earth, but it’s around 6.4 billion km (4 billion miles) distant, so it’s tough to spot without a good telescope. My current telescope is a Takahashi FS-128 apochromatic refractor. It’s a very good telescope. I bought it back in 2005, just in time for that year’s Mars opposition. It gave me my best view ever of the Red Planet. On October 25, 2014, our astronomy club had an open observing session. That night my primary target was Neptune. The above image is a not a photo. With my scope running at over 300x magnification, vibrations would have degraded the image sharpness. Rather, the image is a simulation of what I saw with my eyes. 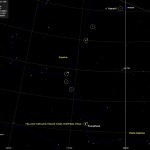 It was rendered by Sky Chart, a virtual planetarium. This free open source app does an outstanding job of rendering the sky as it appears to the eye, using accurate colors and apparent object sizes. 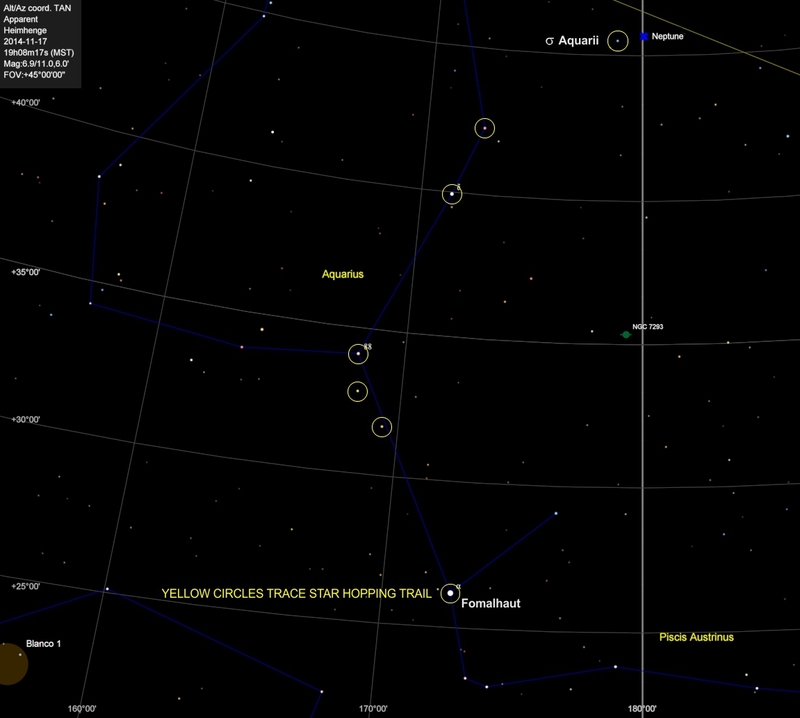 The yellow circle shows the field of view (FOV) my telescope provided. Finding Neptune was not easy. I had printed out a chart of that region of the sky, and when I set up my scope, easily found the brightest star in the area: Fomalhaut at magnitude +1.72. From there, I proceeded to star hop to Neptune. Star hopping is a time honored tradition in astronomy. Following a start chart, one simply moves from one star to the next and, after a time, arrives at the destination. Aquarius is a very faint constellation, with its brightest star only magnitude +2.9, so even with a very good telescope, the process took me a couple hours. Click on the thumbnail below to see a copy of the chart I used to find Neptune. Note how I started with the brightest star in the field of view (Fomalhaut), and hopped from there to the brighter stars along the “trail.” This is the view you would see tonite, should you feel like hunting. Neptune (marked with a blue X) moves very slowly through the constellations, and will be in about the same place as shown in the chart. FYI, the object marked as HD212758 is a dim star with only a number and not a name. Its magnitude is +9.4, compared with Neptune’s +7.4. For comparison, σ Aquarii has a magnitude of +4.8, and can just barely be seen with the unaided eye. 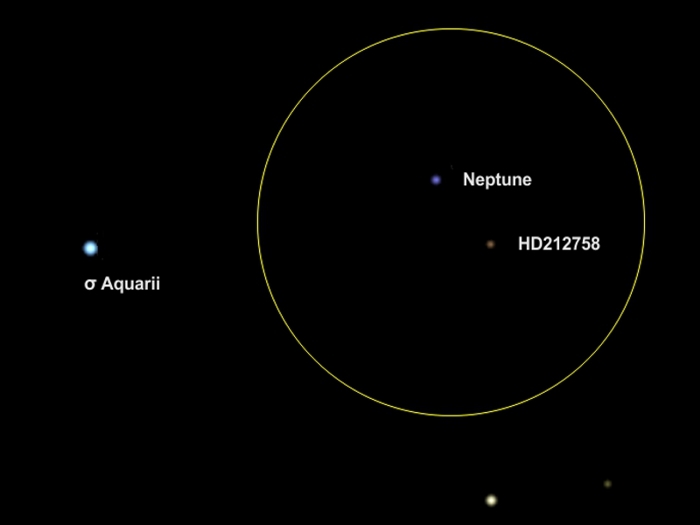 Notice how on that star chart, Neptune is shown at azimuth 180° (due south). When seeking a dim target, it’s helpful if you can catch it at culmination. That’s when it’s highest in the sky for a given evening, and that happens when it crosses the meridian, the line running north and south across the sky. At culmination, you’ll be looking through less atmosphere, and avoiding the haze and dust suspended lower in the air. Neptune reaches culmination at 7:08 pm tonite. I should also note that Neptune culminates at an elevation of 45° as shown on that chart, halfway up to the zenith (the point directly overhead). But that elevation is for Arizona at latitude 34°. Observers at other latitudes will see it culminate at an elevation of: E = 45° + (34° – your latitude). So observers farther north will see it lower in the sky. In fairness to those considering astronomy as a hobby, you no longer need to star hop (unless you want to). Many newer telescopes are computerized and use GPS. If you want to find Neptune with one of those scopes, you simply select Neptune from a menu on the controller, stand back, and watch the telescope move on its own to the correct location in the sky. When it stops moving, you look into the eyepiece and immediately see your target. Once you have the scope set up, finding any object takes only minutes. These computerized systems are called “go-to” scopes. You’ll find your targets quickly, so you can observe more objects on any given night. Maps of the sky are no more necessary than road maps, now that we have GPS. The number of celestial objects stored in computer memory is mind-bogglingly huge. Only the object names (or numerical designations) are needed. You don’t need to learn coordinates. These scopes are expensive, and much of the cost pays for electronics — not optics (but the view is still good). Proper setup is required, and is also computerized, but requires reading and following the owners manual. If your batteries go dead, you’re basically shut down until you replace them. You are deprived of the unique joy that results from search and discovery. To some purists, computerized astronomy is like fishing with sonar. It just seems like cheating. To be sure, professional observatories are totally computerized. The astronomer tells the telescope operator what the target object is, and can then get down to business. And that’s the point … it’s a business at that level, and time on a major telescope is hard to get, even for a professional. All formal proposals for observing are refereed for scientific value, and if accepted, are only then added to the observing schedule. Wait times can be months or even years. But as a hobbyist, the scheduling is up to you. No rush. No worries. No formal applications. Hobbies are supposed to be relaxing and enjoyable activities. I often go out and just scan the sky with no particular target in mind. Every amateur astronomer has a personal agenda. Ultimately, the choice between go-to vs. star hopping is up to the individual.